After the war of words betwixt Nikki Sixx and Sebastian most people have heard the tag “former vocalist of SKID ROW”. We´ll leave it at that and Sebastian fronted them during their heyday with milestones like “18 and Life”, “Youth Gone Wild” and “Remember You”. The band split during the grunge inferno in the mid nineties, with Sebastian going one way and the rest (minus Rob Affuso who was replaced by Rob Hammersmith behind the drums) hooking up with Johnny Solinger. Sebastian has done a couple of bands, featured in a movie, voiced characters in Sponge Bob and on Broadway he was Jekyll & Hyde. On the metal side he has released five albums, one live, one covers, and his studio efforts “Angel Down”, “Kicking & Screaming” and now “Give ´Em Hell”. 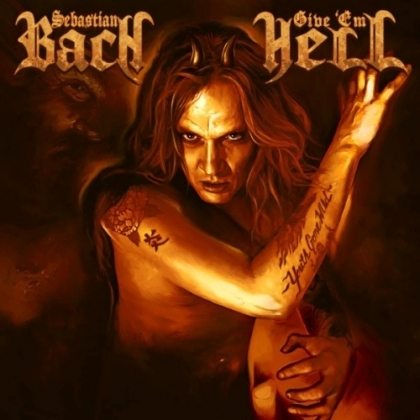 For this album Bach stick to old cronies Johnny Chromatic, guitars, and Bobby Jarzombek (RIOT, FATES WARNING), drums. He has started a collaboration with Duff McKagan and Devin Bronson in 2013, who also featured on the album. Bob Marlette (BLACK SABBATH etc.) returned to produce. There is a lot of 90´s vibes and even RUSH riffs on this album. Opener “Hell Inside My Head” burst off with a fine and spirited riff but turns into a strange take on a RUSH-riff and adds a lot of everything that was dire about the nineties. Next up is “Harmony” which I never thought Seb would do. The riff is not what I expected but with the right RUSH tinges and swell arrangements it really works. “All my Friends Are Dead” is more no smiles metal that rocks and has interesting lyrics. The album is really along those lines. The downside is represented by heavy groovy songs with too much nineties in them; “Taking Back Tomorrow”, ”Push Away”, “Forget You”, "Disengaged" and the abovementioned “All My Friends Are Dead”. On the plus side we have; “Gun to a Knife Fight”, the absolutely spiffing power ballad “like it used to be” “Had Enough” and the almost country tinged storytelling of “Rock´n´Roll Is a Vicious Game”. The rest are somewhere in-between. We all know the voice, we have all heard the classics, please return in full glory next time around. Or maybe...even...reuni... I dare not say it.